It all started with pancakes. As many great things do. Kim Boyce, former pastry chef at Spago and Campanile, left the industry to settle down and have a family. At home, she was inspired to bake but wanted to create healthy options for her kids without spending all day in the kitchen. While shopping at the market, Boyce picked up a small sack of Bob's Red Mill 10 Grain Pancake Mix. 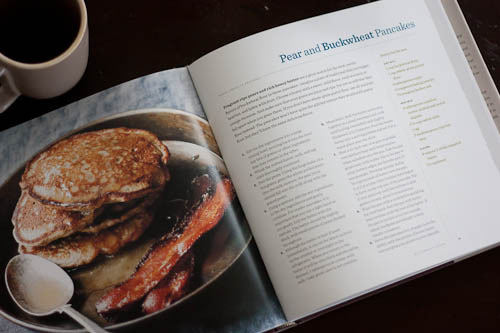 Later in the day, her young daughter was hungry and there wasn't an immediate plan for meal-time, so Boyce grabbed the flour and added in apples, pureed beets, milk, eggs and butter and had some darn fine (and unique) pancakes on her hands. This began her interest in cooking with whole grains. And I'm so, so thankful that this interest turned into a minor obsession and a very real talent, yielding her special cookbook, Good to the Grain. And the recipes are truly original and insanely appealing. From strawberry barley scones to muscovado sugar cake to ginger peach muffins -- morning and evening treats are included and photographed beautifully by Quentin Bacon. Bacon knows how to photograph rustic desserts, capturing the simplicity of a scene, the slight dimness of morning light, and evocative shots of half-eaten desserts. This book has been on my bedside for the past two weeks and I look forward to crawling into bed and climbing into Boyce and Bacon's world each night. Actually, it's a world I'd prefer never to leave. The book itself is organized logically, with twelve different grains/flours covered and each chapter donated to one of them. For example, Boyce begins with a chapter on whole wheat flour and ends with spelt. Somewhere in between you'll find recipes that include amaranth, teff, rye, kamut, buckwheat--and so on. 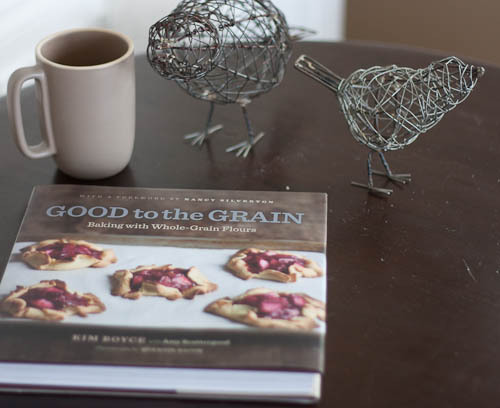 There are 74 recipes total, and Boyce gives a great list of online sources to order some of the grains (page 200). After all, not all of us are lucky enough to have Rainbow Grocery or other natural foods stores with great bulk sections in our backyard. To close, I'm moving again. More on that later. But as you all know, moving has a way of forcing you to purge things you're not using and packing up the things you want to hold onto. I have trouble letting go of cookbooks, but I did donate a few this time around to make room for some new ones and to make life just a little easier come moving day. But I know for a fact that Good to the Grain isn't going anywhere. I've never been so excited to read, absorb each word and tip, and bake and bake and bake from a book. While I hope this move will be almost the last for a very long time, I know that Boyce's book will make it into any U-Haul that crosses my path for many years to come. My first impulse when I’m tasting a dish or a baked good I’ve never had before is to think about how I would do it differently, how I would improve upon it. I love it when I come across something and think ‘This is perfect! I wouldn’t change a thing!’"
Monday, May 24th at Omnivore Books: 6-7 p.m.